﻿ Rosenkreuzstilette Article 6: Yes, Really. Part One. Part Two. Part Three. Part Four. Part Five. Part Six. It has everything to with another acronym: SEO. Back when I first discovered and started Googling it, I would always type in Rosenkreuzstilette to the square box in the middle of the screen. The sites I found all teh cool kids were saying "RKS" or "rks." I wanted to be cool like them so I used "RKS" all over the place as well. Well, heap many moons later, out of the blue, It occurred to me to actually do a Google search on "RKS." The results were devastating. Nothing on page one, two, three, four, (Like most other NCOs I can count that high, now can I make it to...) five, and so on. That told me that I needed to employ some Search Engine Optimization. What is SEO? One thing it is NOT are those emails I get telling me to pay them to get to the top of search engine rankings. That's total BS because the techniques they employ don't work and can actually cause you to fall in rankings and also in some extreme cases get you kicked off of Google search results. Yeah right, pay some smarty-pants $200 dollars to fall in rankings? I'm not a smart guy, but I would like to think I'm smart enough to at least listen to those smarter than me. From them I learned that I can fall in Google rankings all on my own and for free. SEO is basically using keywords and phrases that will show up in a Google search. (There's more, but I'm opting to employ the KISS method.) The three areas you want to look at are the title, body, and images. By the way, there is a section on a web page for meta data, and people just love to fill this up with all kinds of keywords, forget it. Google completely ignores this section. Another thing Google ignores is alt text for images. Unless your doing it for you or as an easter egg (*cough* hint hint *cough*) don't bother because it is pointless. The first thing is the Title. It is also now the most ironic. That is where you kind of want to go and do a one liner about your page. The irony is that Google sees and uses it, but for some some strange reason Firefox, Internet Explorer, and Chrome DO NOT display the title bar anymore. It is in the page tab cut off so that it can't be seen by the reader. The neat-o thing about keywords and phrases is that they don't have to be together to work. "Rosenkreuz" and "Stilette" can be on opposite ends of the page and and Google will pick it up. Key phrases don't have to be together as well. An odd example of this is what happened on my blog. I have been reading the manga Rosario Vampire for a few years now and I wrote a couple of articles about it. 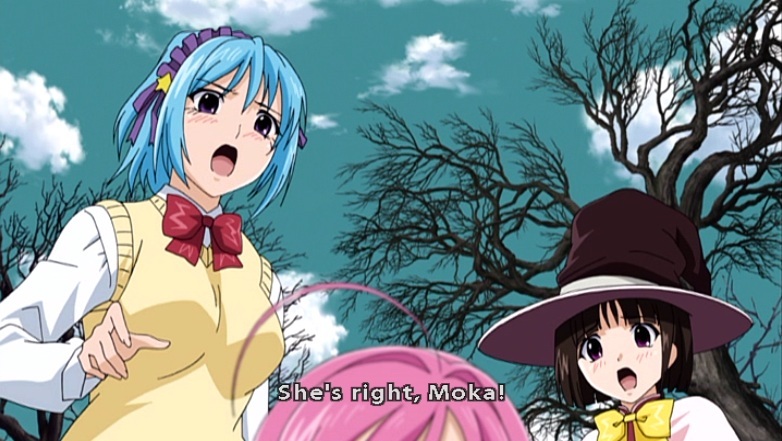 While perusing my stats, this phrase came up: "Why did Yukari say old farts in episode 6 of Rosario + Vampire?" And somebody clicked on the link provided by Google. My mind was a boggling. I didn't use the word fart in the two articles I had up at the time. However, just to the right of EVERY article on my blog is the archive that has the name of EVERY article on my blog. It's a drop down menu of sorts, but Google did pick up the word fart in one of the links there and combined it with Rosario Vampire and Yukari which sent one whole person to my blog. A lesser known form of SEO is image names. I have yet to figure out all the intricacies of naming files for SEO, I have found that simple is better. 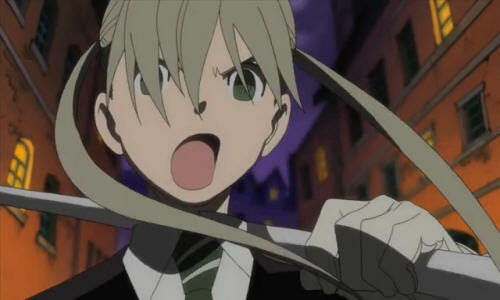 The file name is maka.jpg. I kid not you. These have at one time or another brought people to my site. 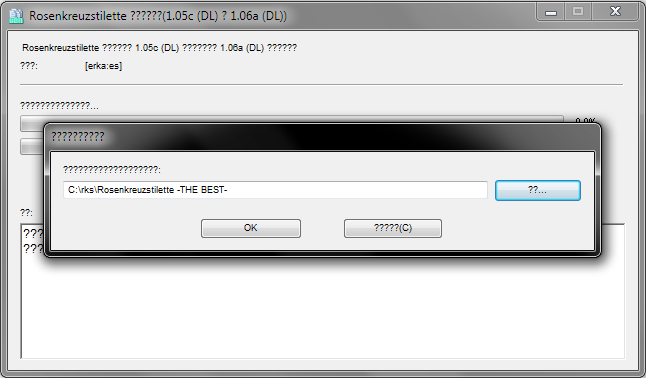 I don't know why, my only guess is that it is the filenames. These are the only other images that have ever gotten someone to click on my site. Isemiya and Womi are damn fine artists, but I think they are trying too hard. I believe that is why Rosenkreuzstilette 2 has yet to come out. They are too busy nitpicking every little detail and in turn are disappointing the fans. When I first talked about this there was one other thing I wanted to say, but forgot. Looking at , what else: Megaman, shows what I'm talking about. The original NES games looked pretty good. Hell, Megaman 9 and 10 were made in 8-bit style on the Wii, PS3, and X-Box 360. One of the things that made the NES and Gameboy game enjoyable to me was the simplicity of the graphics. However, there was a subtle complexity about them as well. Taking 8-bit baddies from the 80's and giving them the 32-bit treatment in the 90's looks awesome standing motion less on this page. But, get them moving a hundred miles an hour on a screen with a hundred other things and a background full of about a hundred things and I'm totally unable to appreciate the fine craftsmanship that went into making even simplistic designs as these, compared to the rest of the game. Better examples would be the X games. Megaman X 1 and 2 are okay enough, but with three. The graphics were way over detailed on such small characters. It is difficult for me see much in the way of detail because it becomes a mush when things get moving fast. It gets worse with the PSX versions. With Zero, ZX, and EXE. I can only play them on an emulator. That way the screen is blown up to something that is actually viewable to me. Why do I have Cutman and Woodman: 2 each? When pasting that image together from sprite sheets I downloaded back in 2003, I noticed something hinky about Cutman. There's dark grey between Cutman's right arm and body. 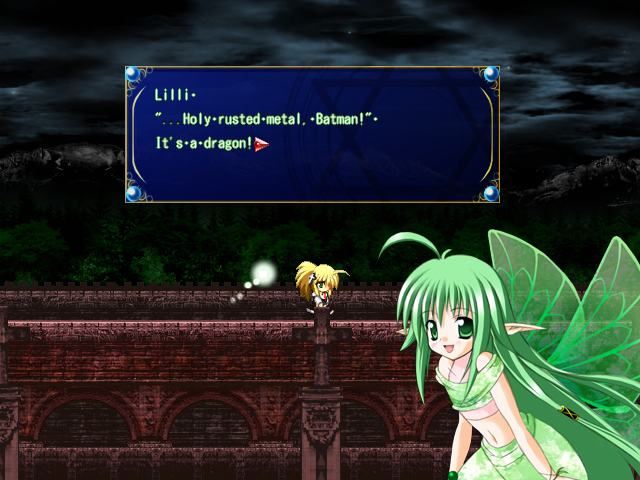 I did a quick check over at Sprites Inc and found that was not the case with the sprite sheets there. As a matter of fact Cutman is orange and Woodman is light brown. Where I got those other ones I don't know. I checked Shy Guy Kingdom and Spriter's Resource with no luck. I even checked out some defunct sprite sites on the Internet Wayback Machine and nothing. Back to my main point (finally.) Isemiya and Womi are consummate professionals because of their skills and their not bitchy attitude about fanworks. They should be hired by a major gaming company and have their talents put to good use. I must say, guys, please, please, we have waited long enough for RKS 2, the only thing you are doing is nitpicking the game into oblivion. Starting in 2006, I became bored with doing the comic. Other things had my attention. Like getting the date with Yuffie on Final Fantasy 7. (That one is the best.) Plus all the other stuff going on in my personal life at the time made it so I only did 150 comics that year. The next year was worse. I started out okay, but made one major mistake: Concentrating on one storyline the whole time. The comic went from boring, to a chore. As a matter of fact, I was lucky to achieve 150 comics that year. I had to force myself to make them. Some got made in 2008. It was time for a break. A long one. In fact the two year lead time (something I constantly bragged about,)	I had built up due to my vacations in Iraq and Afghanistan, had completely evaporated. The final comic for Season 2007/20 was finish the day it was posted. I had started working on Season 2010 towards the middle of 2009. I just found it downright impossible. I was going to call it quits. Put a sign up on the home page saying goodbye. 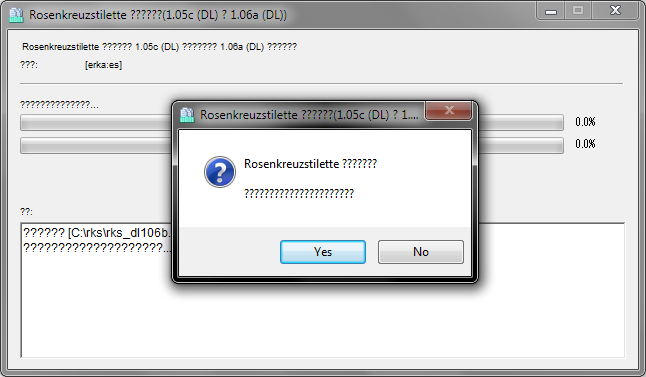 Then I found Rosenkreuzstilette. All these ideas about trying to find a sacrifice for Talos, the legal troubles of the Swim World Federation, and the Fairy Conspiracy flooded my mind. I had to do them all. Albeit it was too late in 2009 to try and get 200 comics done. Okay, I could have, but after doing the math I found if I did 100 that year, then 200 each year after that I would get 3000 comics done by 2017. Perfect. I have plans. The fun had come back. I got a good three years of comics out of it. However I am done making Rosenkreuzstilette comics, for now. There's still a couple I want to do. When I feel like it. How to Apply Rosenkreuzstilette Patches. Yes we do. 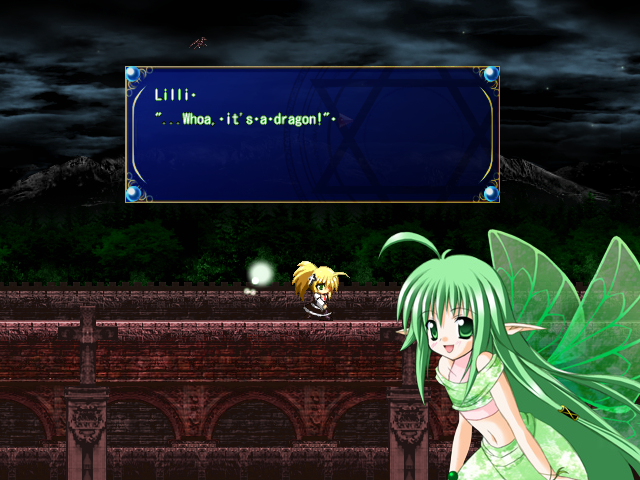 The game was originally made back in 2007. In the days of Vista. We have come along way since then, so must the game. Erka:es has endeavored to fix bugs and make sure it runs on modern systems. Why am I discussing this? Isn't there plenty of other sites that go through this? Well, people are asking how to, and they are clicking on my sites, but not finding the answer. So here I go. Before you start: Make a copy and only screw with that copy. Always save an original. I'm somewhat sure that this is asking do you really really (say it like the Miz now:) REALLY want to do this? Click Yes. Click the two question marks at the side of the white box and that will open up a drill down menu where you have to find the game. Finally click "??? (C)" and you can play your upgraded version of Rosenkreuzstilette. Remember what I said about making a copy? 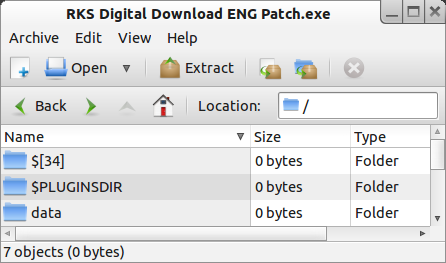 Make another copy of the original 105c and apply the English patch. (I'm not going to show that because it's exactly the same process.) Now copy the "scenario.dat" file from English 105c and paste it into Japanese 106b. Now you have a somewhat fully enjoyable version of Rosenkreuzstilette. 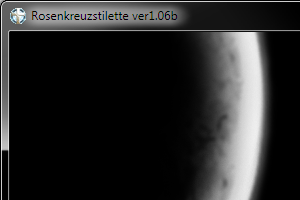 And Now, Some Fun With Linux. Want to know a little secret? I would really love it if I could dump Windows and go with something else. Why don't I? For the typical reasons. I would still need to install a copy of Windows on a Mac in order to play the game we all love. It opened up like a file folder! No kidding! I could see all the additional folders and text files and DLLs. I thought to myself: "Self." "Yes?" "What would the English patch look like under these conditions?" "Let's find out." I got somewhat excited about this. You see I wanted to help people out that upgraded Rosenkreuzstilette all the way to 106b but didn't apply the English patch. As you know the English patch only works on 105c and down. Also the 106b Patch doesn't work on an English patched game. (I have had some requests to post the scenario file, I say the neigh. I have respect for the work and will never do such a thing.) 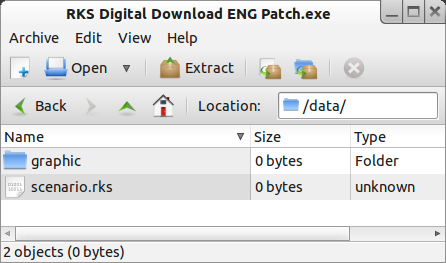 To overcome this I wanted a fairly legit way of extracting the scenario file from the English patch to copy it to 106b. Cool, huh? I'd bet that scenario file it not too far away. 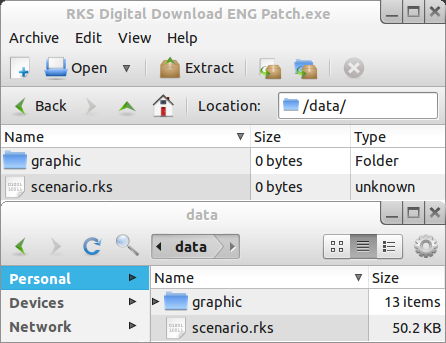 Odd, "scenario.rks" and file size is zero? What happens when you copy this stuff out of the exe file? First the good news: the dot rks seems to be the same as the dot dat files. Even the RKSDAD will read it as such. The bad news is that it is empty. Despite the fact it clearly shows a file size similar to the file in the game. There's nothing in there. 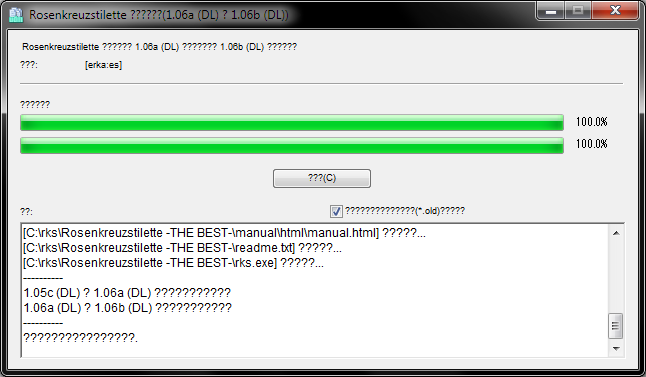 I've used all kinds of DLL viewers and other decompilers to find the English text file to no avail. I fully recognize the fact that my programming skills a much better suited to playing video games. Yeah, there's more. Maybe in a few more years. I mean, jeeze, I haven't even played the game in over a year.